This week started with the most severe cold front of the summer lasting 3 days having lots of rain, high wind and dropping temps down to a high of 47.8F on 8/23 & a low on 8/24 of 37F. 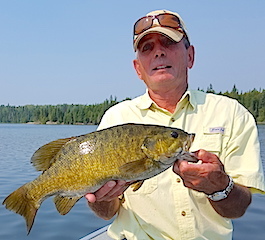 caught their 11th trophy with Steve landing the biggest of the trip a HUGE 20�?� Smallmouth. He also caught a 36�?� Northern Pike. This concluded their trip both having had wonderful time making many memories. Long time guests, since 1994, Larry Beard & Jerry Miller Erwin, TN returned for their 2nd trip this year coming back with Jon Beard Virginia Beach, VA, John Hook Jonesborough, TN returning for their 2nd & 4th time plus guests Duke Osborne & Bryan Gast Coeburn, VA. DOA Jerry & Brian caught some nice Northern Pike including 2 at 38�?�. 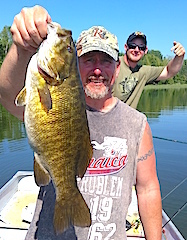 1st day Brian got a nice Muskie, his 1st ever, John caught an 18.5 football of a Smallmouth & Jon also had a big Trophy Smallie. 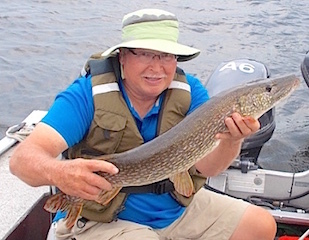 2nd day all caught fish with Larry & Jon alone landing about 25 Pike. 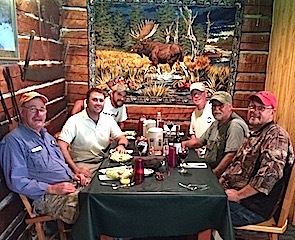 3rd day brought our most severe cold front of the summer making these avid anglers stay in, but all had a fun & plenty of laughs telling past fish stories. 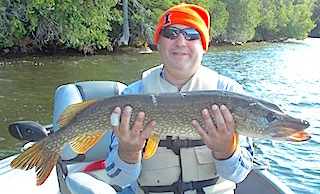 4th day this group was ready to fish, having an active day with Larry & Jon doing the best catching 40-50 Pike. 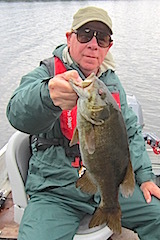 5th day despite being slower than they are accustomed to all caught fish & Jerry landed a Trophy Smallmouth Bass. 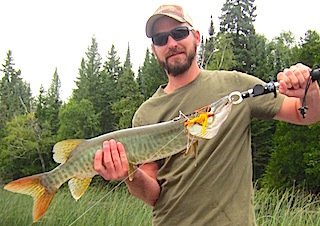 BIGGEST Muskie he very saw in the 30 trips with us, the fish straightening out the snap on his leader and Duke caught a nice Tiger Musky. Before leaving Larry said he would be in touch soon to reserve dates for 2016. Ed & Brian Ulch, Sal & Kim Leone, plus father daughter Brian & Sylvia Havlicek all from Solon, IA were visiting us for their 1st time for a family fishing adventure. 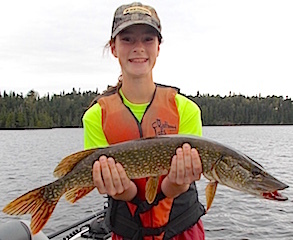 DOA they caught some fish & Sylvia set the bar catching the largest Pike. 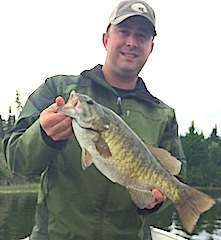 1st full day all caught fish, mostly Northern Pike, and Brian caught a big 17.5�?� Smallmouth Bass. 2nd day they had to face a severe cold front, which started on day 1, with rain & very windy conditions. 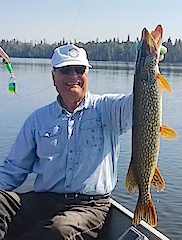 This is tough conditions for the most experienced on our lake system however the did great fairing the weather all day, being the last boats in for supper and caught some nice fish with Brian having the hot hand at the end catching 10 Northern Pike just before supper. He said the action was fast catching 4 Pike in 4 casts. 3rd & final day that front hung around until about noon then finally cleared & got nice. They caught fish throughout the day & had a shore lunch at Twin Falls. During lunch, Sylvia while fishing below the falls got hung up on what she thought was a log. While attempting to free her lure from what she thought was a log, all of a sudden it took off taking line very fast before the lure popped free. Obviously Sylvia had hooked a BIG fish that felt like a log. Sal also caught his biggest Northern Pike a nice 35�?�er. All had a fabulous day and a terrific family trip making memories to last a lifetime. Returning was long time guest George Marshall bringing his father Bill for the 1st time both from Sparta, TN & return guests Rick Stewart Mount Juliet, TN brother Steve, Jimmy Trout, & Justin Tomko from Lusby, Frederick, & Dunkirk, MD. 1st day these guys were slapped in the face with a northeast cold front with high wind & lots of rain. 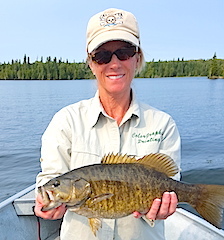 All faired well catching fish, with Jimmy & Steve doing very well catching many Pike and a few nice Smalllmouth Bass. 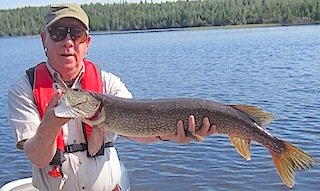 2nd day between George, Bill, Rick, & Justine they caught over 70 Northern Pike. 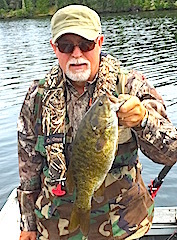 3rd day fishing was good with Justin catching his 2nd & 3rd Muskie of his life, landing his first the day before, Steve caught 2 Trophy Smallmouth Bass & Jimmy also landed a Trophy Smallmouth Bass after supper. 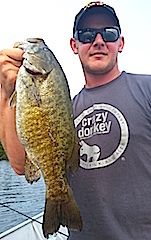 4th day Justin had the hot hand catching many Smallmouth Bass & Northern Pike on a white spinner bait. 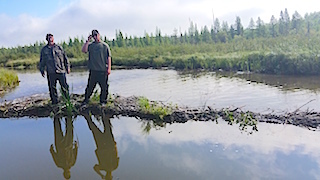 George & Bill while fishing a portage lake for Muskie caught 4 plus spotted a Moose & were able to get within 15 yards of this magnificent animal watching & videoing it feeding in the water. George said it was huge & by far the biggest Moose he had ever seen. 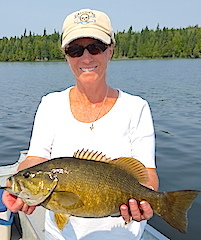 5th day George caught 2 Muskie & some nice Smallmouth Bass while Rick & Justine caught a lot of Pike & Smallies. 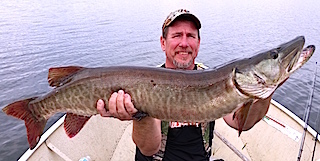 Jimmy & Steve spent 12 hours fishing for Muskie & it paid off catching 8 including 2 over 40�?� Steve landing both a Barred & Tiger Muskie plus Jimmy landed a nice 33�?�er. That�? ?s a FBAULOUS day Muskie fishing in anyone�? ?s book. Because of flights Jimmy, Steve, & Justin stayed one more day a it paid off having a terrific finish catching 45-50 Northern Pike & having a lot of action on the surface. All left having & fabulous time & saying they will be back. Here for their 1st visit were Greg Mruk & Mike Catuscelli from Park Ridge & Prospect Heights, IL. 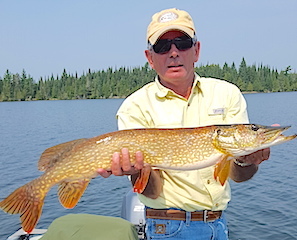 1st day was spent learning the new waters & Greg caught the fish of the day a mid-30�?� Pike. Also they were happy to see their friends Wade, Dave, & Kurt mentioned below who arrived. 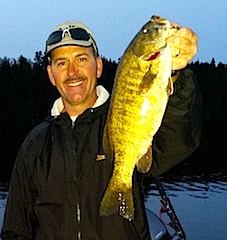 2nd day they did great catching many Northern Pike, Greg with 10 & Mike about the same & landed some Smallmouth Bass. 3rd day did about the same day 2 but today the ticket was a throw back lure the old stand by Red Eye Spoon. 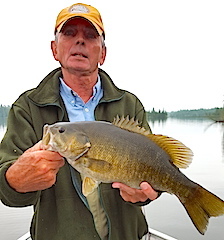 Greg even caught a few Smallmouth Bass with this spoon. 4th & final day they finished catching some nice Pike. Also here for their 1st time was Wade Kiess, Dave Goacher, & Kurt Koziol from Mount Prospect, Libertyville, & Prospect Heights, IL. DOA these three went out & caught a half dozen Pike in a few hours before supper. 1st day was great as they hooked up with over 30 fish landing 27 Northern Pike. 2nd day was even better catching 29 bigger Northern Pike, 90% between 28 to 33�?�, & David came up with a HUGE 38�?� very heavy Pike. 3rd & final day even was better catching 32 Northern Pike with 10 being over 30�?� including 2-34�?�, 2-36�?� and another 38�?� Monster that looked over 40�?� having a huge girth. All left having a fabulous time looking forward to their return. Harlan Johnson & John Utley from Park Rapids & Vadnais Heights, MN were fishing with us for their 1st time. 1st day they had a wonderful day getting the feel of our lake system and by day 2, using the old stand by red & white Dardevle, caught a bunch of Northern Pike. Both John & Harlan are long time friends growing up together in a fishing community in Bemiji, MN and just love being on the water as a way of catching up with each others daily lives & reminiscing about their early days. 3rd & final day they enjoyed catching some nice Northern Pike with Harlan having the hot hand, John saying he was the expert net man. Both left having an enjoyable stay loving every minute of their time.